, Google’s global week of community service. I signed up thinking it would be fun and indeed it was, as per usual with any Googley event. 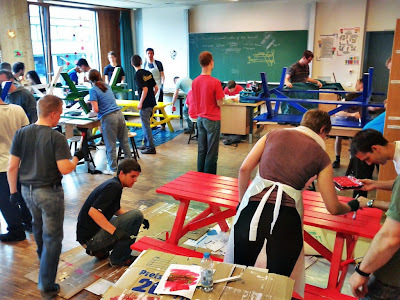 This year, Google Serve in Munich had a project building and painting benches for a children’s school. We built five benches and painted them with Google colors. I wasn’t really good with the building part, so I preferred to have the role of painting in blue - my favorite color. I had a really good time bonding with my fellow Googlers and I am thankful I had the opportunity to participate and give back to the community. Another piece of good news: I got an invitation to the 2011 Intern Summit that will be held at Google's offices in Zurich, Switzerland. Engineering interns from all over Europe, the Middle East and Africa will join their Zurich colleagues for this two-day event, which will include tech talks, workshops, networking sessions and social activities. I’ll be sure to recap the Summit in my future posts, so stay tuned. Lest you think I’m never at my desk, I’ll share some updates about my actual engineering work on the CodeSearch project . The project is going well, and though it’s challenging I’m eager to learn. I’m not only gaining programming skills but also time management, planning and organization skills. I even started to work on a second task for the second half of my internship. My mentor is really a helpful and great advisor. I submitted my mid-term self-evaluation to my mentor—turns out it’s not an easy task to evaluate yourself! Now I’m waiting for an evaluation to be submitted from his side. I’m looking forward to hearing his feedback so that I can identify my weaknesses and strengths and improve my performance during the second half of the internship. I’m also keeping up-to-date with other Google projects and I feel so lucky to be here during the launch of Google+ to be one of the initial users. Projects like these, along with everyone who makes them happen in this engineering-driven culture, continue to inspire me. Fun Google Fact: Over the last two weeks, Google Munich celebrated two events I’ve never heard of, but of course, Google is full of surprises like that. The first one was Bavarian Day where I enjoyed traditional Bavarian food like Schweinsbraten (roasted pork), Wurstsalat (marinated cold sausage cut in thin slices) and Kartoffelsalat. The second event was Asian week and I tried a lot of new Asian cuisine that I really liked! Who knew I would master chopsticks in Germany! I can’t believe that I’m halfway through my internship; time flies! Just after my first post went live, I got an invitation to join Google Serve, Google’s global week of community service. I signed up thinking it would be fun and indeed it was, as per usual with any Googley event. This year, Google Serve in Munich had a project building and painting benches for a children’s school. We built five benches and painted them with Google colors. I wasn’t really good with the building part, so I preferred to have the role of painting in blue - my favorite color. I had a really good time bonding with my fellow Googlers and I am thankful I had the opportunity to participate and give back to the community. The Intern Summit seems to gather Googlers from the EMEA region. So I think you probably meant Africa instead of Asia. @Monica and @Kisso Thanks a LOT. Hello Mirna, this is a really good blog and glad to see that you're having fun. I have a question related to internships. I am interested in a Hardware Engineering intern position at Google but I can't seem to find the correct method to reach someone. If there is a position that I am interested in but it only asks for full-time people how would you send your resume even though you were interested in that job but wanted an internship instead? By the way, I'm a PhD student and I'm intending to apply for an internship (most likely SWE). However, I'm afraid it may be hard to find a project so that my work is useful for both Google and my PhD. Can you describe how Google select projects suitable for PhD students? I am an automated Software Engineer working and living in zurich. I was actually looking forward to knowing someone with your qualifications and interesting background as well as experiences so that we can share a delightful evening based on tech-information exchange. Would you be interested in me inviting u over dinner when u arrive zurich.